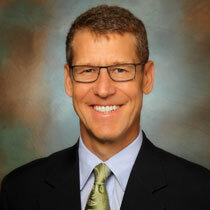 Dr. Hurlbut is a board certified orthopaedic surgeon. He completed his residency at the University of Vermont in 1993, and a fellowship in Hand and Upper Extremity Surgery in 1994 at the University of Minnesota. He subsequently earned a Certificate of Added Qualification in Hand Surgery from the American Board of Orthopedic Surgery. Dr. Hurlbut has been admitted to that American Society for Surgery of the Hand (ASSH), an elite professional society of hand surgeons. Prairie Orthopaedic & Plastic Surgery, PC and Dr. Hurlbut’s team uses the most advanced treatment options for recovery of maximum mobility, strength, and return of function. Dr. Hurlbut’s passion has been the diagnosis and treatment of shoulder, elbow and hand injuries but he also continues to practice in many areas of orthopaedics including total joint replacement and knee arthroscopy.